Jared Unzipped: Live365: A Post Mortem. For nearly sixteen years, I've enjoyed the various radio broadcasters at Live365.com, one of the internet's earliest and most diverse radio broadcasters. Unfortunately, that has all come to an end. Thanks to new regulations regarding small and medium sized radio broadcasters, Live365 was forced to shut down permanently. The Copyright Royalty Board, which governs the licensing and legality of broadcasting copyrighted content, altered their rate schedule for the 2016-2020 cycle period. As such, the cost for the little guy to broadcast music became exorbitantly more expensive, largely an action viewed as a means to push out everyone but the biggest of broadcasting corporations. Due the increased rate, Live365's investors pulled the plug on the long-running broadcaster. Live365 is now dead in the water. Their front page currently features a thank you message to all of their former users. 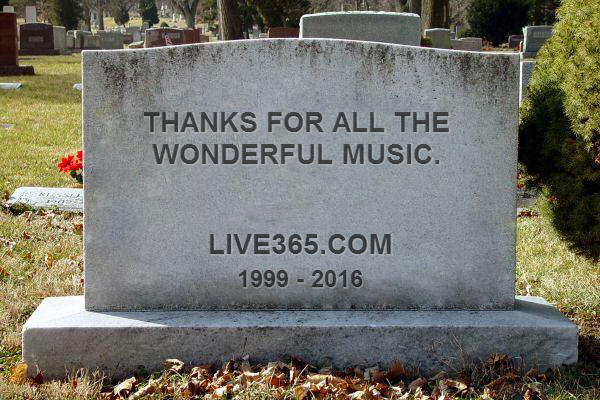 I lament the loss of Live365. Something of a relic from the early days of the internet, Live365 featured a plethora of custom radio stations playing music genres not normally heard on regular terrestrial radio. This is where I came to appreciate Darkwave, Gothic and Synth music in the early 2000's. Numerous Live365 broadcasters also created some great holiday-themed stations, both for Christmas and Halloween, that I returned to year after year. Sadly, the world of corporate music just made it impossible for Live365 to continue on. So many great stations have been lost, featuring under-the-radar and largely undiscovered musicians with a massive amount of talent. Perhaps this is a sign of the evolving times, where individual entrepreneurs and broadcasters are being edged out.. forced to abandon what they so desperately cherish, all for the sake of art. Live365, you will be missed.